Rheinmetall Automotive has, together with its Chinese joint venture partner HUAYU Automotive Systems (HASCO), opened yet another production location. Around 16,000 square meters, the new plant of HASCO KSPG (Guangde) Nonferrous Components Co. Ltd. is situated in Guangde in the Chinese province of Anhui, northwest of Shanghai. This is the sixth location of the joint venture in China, and its range of products will include aluminum cylinder heads. With an annual production volume of around 5.5 million units, Rheinmetall Automotive is China's biggest manufacturer of cylinder heads. The new plant will bring the company's production capacity to over one million units in 2018. Initially, the plant will generate sales of 560 million RMB (equivalent to around €70 million). Over the next five years, annual cylinder head production is scheduled to almost double. 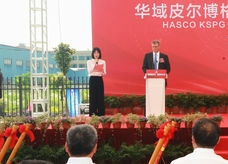 In addition, the plant will be the first within the joint ventures with HASCO to use the sophisticated and premium-grade low-pressure casting technique for the production of electric housings for electric vehicles destined for the Chinese market. Horst Binnig, CEO of Rheinmetall Automotive AG, commented on the occasion of the plant opening in Guangde: "With this new plant, we are laying the foundation for the lasting participation of our companies in a strongly expanding and sustainable submarket within the mobility segment. In addition, we are proactively sharing in the further growth of this country's electric mobility segment and establishing ourselves as a serious player in this forward-looking technology." The new Guangde plant will increase its workforce to 450 by the end of this year.